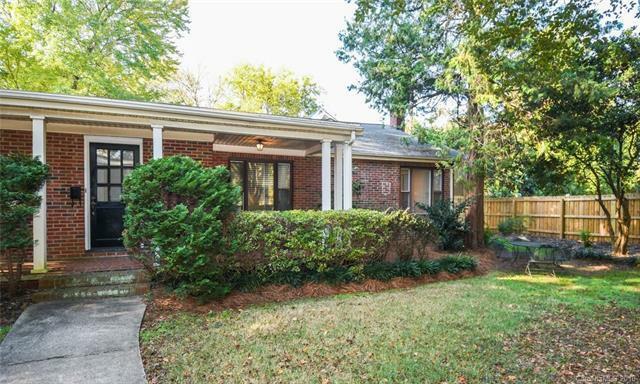 Adorable bungalow style 1 story condo in Myers Park under $168K! Minutes from Uptown, Cotswold & SouthPark. Hardwood floors thru out w/ tile floors in Bathroom & Kitchen. All rooms have been newly painted. All new LED can lights in Kitchen. New LED light bulbs in remaining rooms. New light switch plates, Bathroom vanity light & CO/Smoke Detector. Large Family Room w/ a big window overlooking covered Front Porch. Front Porch provides a wonderful private outdoor area. It also overlooks the condo Courtyard w/ huge oak trees & mature plantings. Eat-In Kitchen includes granite countertops, stainless appliances & a pantry. Utility/Laundry Room off of Kitchen is conveniently located. It includes a back door that leads to private yard & gathering area. Master Bedroom includes built- ins and a closet. Secondary bedroom is great flexible space w/ a closet that has hanging space & shelves. Guest parking is provided at the front of the complex. Beautiful private setting! Agent related to Seller.